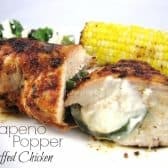 Jalapeño Popper Stuffed Chicken Breasts! All the flavor of jalapeno poppers stuffed into grilled chicken breast. This is a family favorite way to enjoy chicken at dinner! Wearing gloves, cut each jalapeño in half lengthwise. Remove the seeds and inner membranes. Combine cream cheese and cheddar cheese (if using). Fill each jalapeño half with cream cheese. Cut a slit in each chicken breast. Be careful not to cut all of the way through. 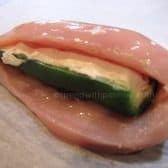 Place a jalapeño in each chicken breast. Secure closed with a toothpick. Generously rub each chicken breast with olive oil and sprinkle with seasoning. Grill chicken about 25 minutes turning occasionally until it is cooked through and internal temperature is 165.